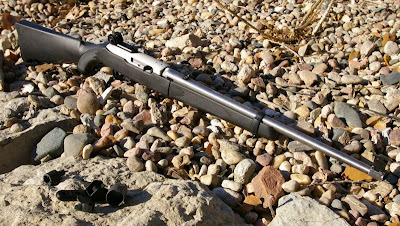 The 10/22 is one of the most fun, rugged, dependable and accurate out of the box production .22LR rifles on the market, however for most of us it represents a starting point for customization and personalization. 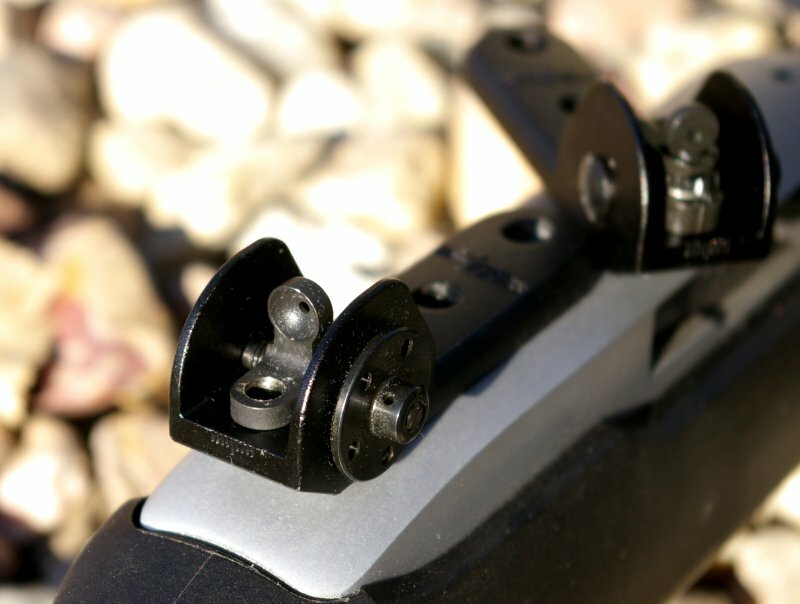 When it comes to the front and rear dovetail iron sights, they work infallibly, but as I and others have noted in many situations there can be huge accuracy, durability, and ergonomic improvements by upgrading to AR style peep sights from Tech Sights. 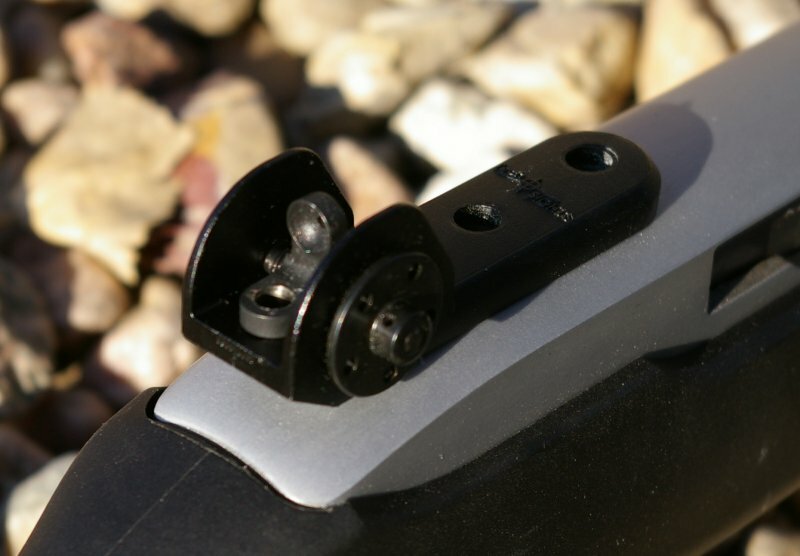 Peep sights have been shown to improve rapid target acquisition and overall shot precision. Where the Tech Sights are unique is that they raise the front sight and mount the rear sight on top of the receiver. 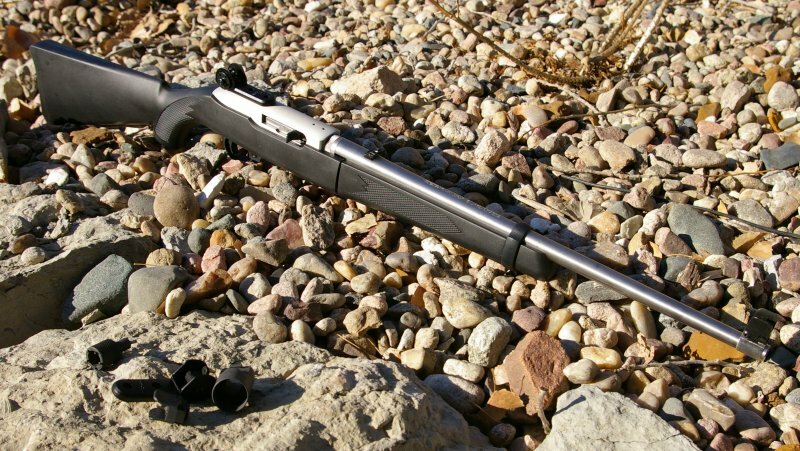 The result is a faster shooting and higher precision sighting solution for dedicated iron sighted 10/22 rifles such as this Ruger 10/22TD Take-Down rifle. Tech Sights even has a solution for for existing bull barrel models as well. 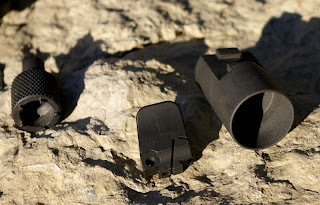 Tech Sights was founded to offer shooters an improved combat durable and higher accuracy sighting solution to rifle which usually do not have the best sighting options. Amount those rifles Tech Sights makes sight solutions for includes SKS, marlin 60 & 795, AK, Mini 14, Remington 597. CZ, Mossberg 702, Savage Mark II, and Marlin 925/917/980/981/XT rifles. 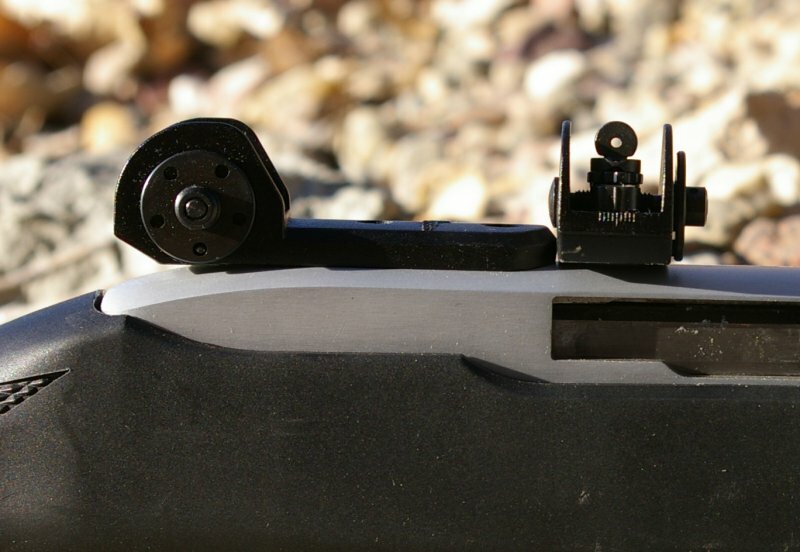 Obviously for the purposes of this review, Tech Sights offers several options for 10/22 owners including front and rear sight kits including either their TSR100 or TSR200 rear receiver sights for factory taper barrels such as shown on the Ruger 10/22TD. The company also offers a slip on front sight for bull. 920" barrels. I picked up both versions of the TSR sights, both sights are identical with the exception the TSR100 has a dual flip style AR aperature and the TSR200 is a single aperture with elevation adjustment. 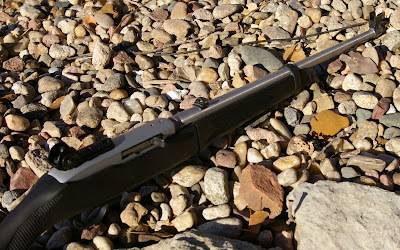 The TSR100 was mounted to my Factory Ruger 10/22TD take-down model and the TSR200 was mounted to my MOA stainless receiver with an 18" .920" bull Feddersen R4 match barrel in a Bluegrass stock. The front sight replaces the factory front sight and is drifted in with a punch and hammer from left to right as any dovetail sight is. Once in place the newfront Tech Sight raises the sighting plane to match the rear sight. The new sights also offer a few other key advantages such as durable billet steel ears which protect a standard M4/AR15 screw in elevation adjustable sight and the rear peep aperture. The bull barrel slip-on front sight, mounts to any .920" bull barrel and provides a front iron sight option without the need to permanently machine a sight dovetail into the barrel. The sight is mounted/glued in place with non-permanent Lock-tite. 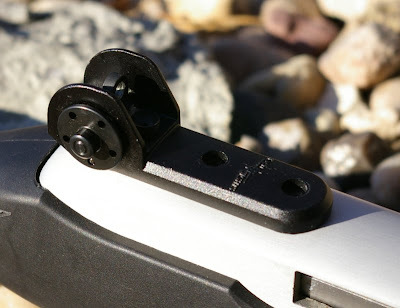 Although it beats a $100 trip to the gunsmith, this is not my favorite mounting method and I would have prefered a design with a grub screw however it works and is a very secure mount for a dovetail front sight. If you are familiar with AR sights then these Tech Sights will seem like a familiar duplication of that great sighting system. Yes, you can use any Mil-spec standard AR15 front sight post you want including night, fiber optic and colored plastic versions. 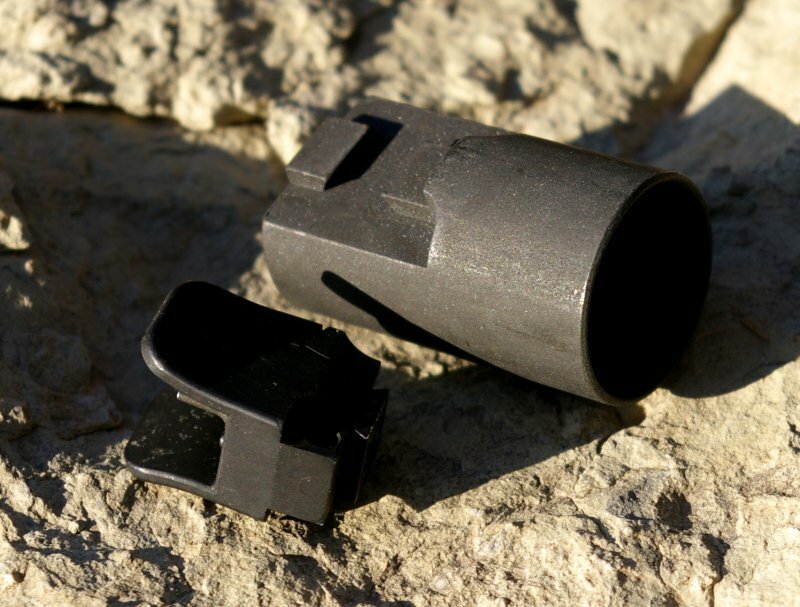 For those of us who have snapped the front stock sight off our 10/22s, you will appreciate the much more rugged and durable steel AR15 sight pins over the less durable factory Ruger bead sights. Just a note that the front post Tech Sights includes is both a taller and finer post. Generally a taller post is required to shoot at shorter ranges and the thinner post can improve accuracy over the standard GI post thickness. The Tech Sights TSR100 model allows the use of any standard AR national match rear flip peep sight as a replacement. Again, this opens up the huge variety of rear flip peep apertures for use of the 10/22. That I know of, the Tech Sights TSR100 is the only way you can get front and rear night sights (in the form of tritium AR15 peep aperture and front post replacement) on a 10/22 without extensive modification. Elevation adjustment is made via turning the front post in 1/4 turn increments just as you would on any AR sight. Windage adjustments are again familiar AR national match style made via the battle spec detented windage adjustment on the rear sight. Precision iron sight shooters will appreciate the added tuning flexibility of the Tech Sight TSR200 which trades the TSR100's rear dual flip aperture for a single fully adjustable aperture. The TSR200 unit has all the same sight tuning flexibility of the TSR100 unit with the added ability for simple small precision elevation adjustments required for various ranges and ammo model changes without the hassle of changing the front sight setting. Both Tech Sights models deliver a more user friendly sight adjustment than the factory sight which are only adjustable via drifting the rear sight for windage or messing around with the reading glass sized screw for the simple blade elevation adjustment. The 10/22 Tech Sights deliver a repeatable click adjustable sighting solution in a format that will not fall out of alignment with even a hard bump or rifle drop. The downside to converting over to this sighting system is that scope mounting becomes a bit more challenging. 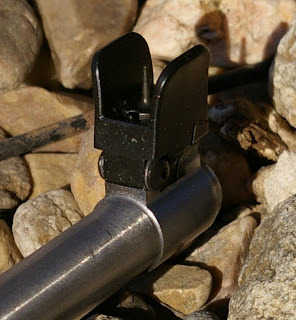 In order to mount either a red dot or scope, the user will need to modify and shorten the factory rail. If a red dot such as a Vortex Sparc or Bushnell TSR-25 is used, then the setup works great, however with a scope, higher than normal rings are required to clear the rear sight. Honestly this is not a sight setup for a 10/22 intended to be scoped, but it is one which greatly improves shooting with iron sights. From a functional perspective, I liked these sights much better than the factory versions. The sights fall in line more naturally with the eye because of the sight height increase. On the stock Ruger, I find I need to smoosh my face down on the stock just a bit to align my eye with the sights; with the Tech Sights, sight alignment was much more natural and consequently faster on target. Additionally, I have found the peep and post combination a much faster and more accurate sighting solution for the 10/22. The 10/22 Tech Sights also provide the shooter more of a M1 carbine style sight picture which coincidentally Bill Ruger modeled the 10/22 after. I can see that some people will want to recreate a .22LR version of a M1 carbine using these sights and an aftermarket 10/22 M1 style aftermarket stock to complete the build. The 10/22 Tech Sights are a fast and easy upgrade that anyone marginally handy can do with just a punch, hammer and mini-screwdriver and a drop of thread locker. Whether you have a bull barrel or standard stock barrel, they have you covered with a solution. The sights provide fast and accurate sighting at a more ergonomic and natural sight height which delivers a faster shooting 10/22. I believe both models have their place. 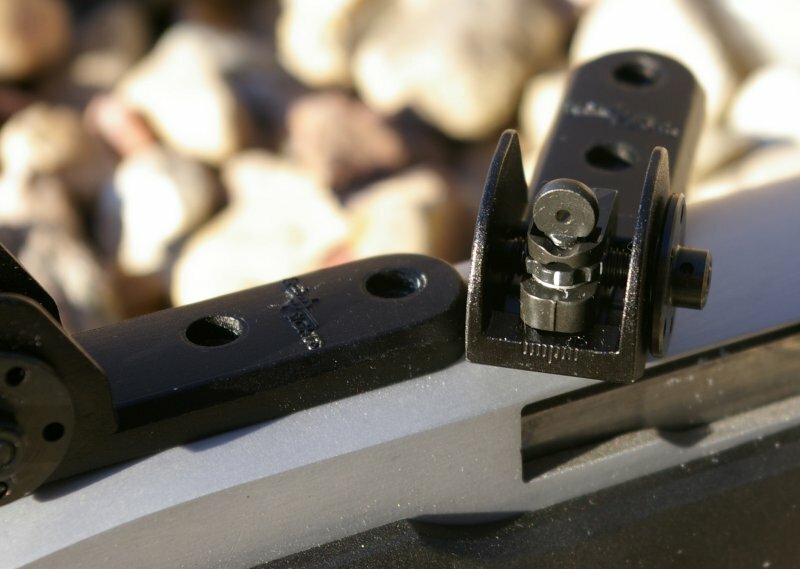 The TSR100 is perfect for 90% of survival rifle type builds, however if you find you need a little extra precision, the TSR200 micro-elevation adjustable single aperture is available as a sight set, as a rear sight assembly individually, or also as a aperture replacement unit for your TSR100 base.